Today we are going to present some insights related to employee’s working the satisfaction using Advanced Analytics tools and techniques. As a source for this study, we make use of the data made available on this link by the data scientist Ludovic Benistant who made important anonymizations. Some pictures have Brazilian Portuguese words, sorry about that! Let’s go! What factors have the greatest influence on employee satisfaction? What are the main satisfaction scenarios that exist? What are the main patterns associated with key satisfaction scenarios? What factors influence professionals to leave? Salary Range (Low = 1, Medium = 2, High = 3); Note: Actual values were not made available. Left the company (Yes = 1 / No = 0). The highest concentration of satisfaction is within the range of 7 to 9, and there are few people with satisfaction scores between 1.5 and 3.0. The factor “Last evaluation” had no relevant influence and it was automatically discarded by VORTX. In the table below we have the result of the processing with the separation of employees into groups done automatically by the platform. In all, 120 groups have been found, and here we will focus on only the 20 most relevant and leave the others out as isolated cases and not the focus of the analysis. Typically managers, as far as we have experienced, are not sure regarding machine’s ability automate the discovery of insights. Therefore, as proof of the model, we chose to show the raw data visually to demonstrate the insights aforementioned. 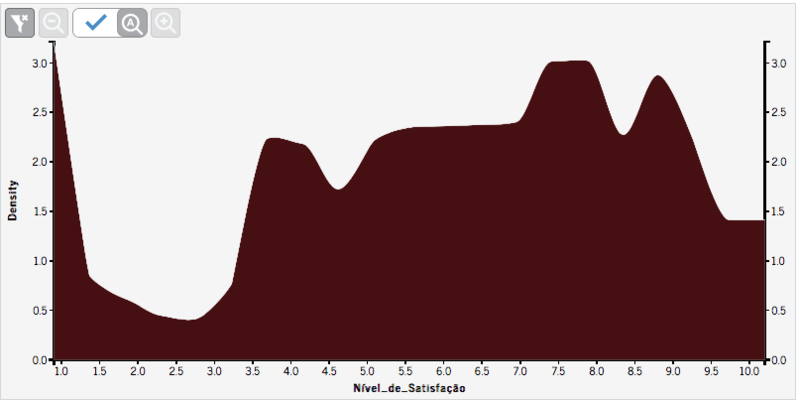 The pattern of hours worked by the 588 people in scenario 9 (very dissatisfied). X Axis = Monthly working hours. The level of satisfaction on the Y axis. Average hours per month on the X axis. Orange colors for people who left the company and blue for those who remain. Circle size represents the number of years in the company. Alright, we just saw the overall pattern including the whole organization, so what would happen if we see it by the department? This study shed some light on the improvement of human resource management, which is at the heart of today’s businesses. Applying data analytics algorithms in this area allows automating and accelerating the process of pattern discovery in complex environments with, let’s say 50 variables or more. Here it was just a few. Meanwhile, the search for patterns in a traditional BI continues to be a purely artisanal work with a well know imitation of 4 dimensions per attempt (read more on this at Understanding the differences between BI, Big Data and Data Mining). The automation of discovery is an extremely important step in predictive analytics, in this case, the evasion of highly qualified professionals and possible dissatisfactions overlooked by management. People in group 1 and 2 (55% of the company) have a reasonable work satisfaction with a weekly load of 50 hours on average, without receiving promotion or suffering an accident at work. The pattern persists in all departments. The most satisfied groups of the 20 largest were the 7 and 10 who worked more than 247 hours a month, took on several projects but as they did not receive promotion they left the company. These people should be retained since there seams to be highly qualified. Group 16 proves that it is possible to earn a good salary and be dissatisfied. These 77 people should be interviewed to identify the root cause of such unsatisfaction. The cut-off line for non-company employees is: minimum 170 and maximum 238 hours worked per month.People with more than 3.5 years of work harder and are more satisfied. Monthly hours above 261 resulted in very low levels of satisfaction. Monthly hours below 261 with a number of projects greater than 3 turns out in high job satisfaction. Scenario 15 shows the importance of promotion over the last 5 years of work. The ones with more than 5 projects decrease their satisfaction, the ideal number is between 3 and 5. Of course, in this case, to better understand the indicator is necessary to better understand what the number of projects represents to different departments. The distance between employee’s home and work. The average time that is taken from home to work. The number of phone calls or emails sent and received. Gender and age and the reason for leaving the job. We hope this information is useful for you guys in some way. If you find it relevant, share it with your colleagues. If in doubt, contact us! A big hug and success in developing your own HR strategy! 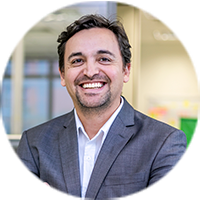 Founder of Aquarela, professor and lecturer in the area of Data Science, master in Information Systems, focused on processes of rapid prototyping of Big Data Analytics and data culture. Founder of Aquarela, CEO and architect of the VORTX platform. Master in Engineering and Knowledge Management, enthusiast of new technologies, having expertise in Scala functional language and algorithms of Machine Learning and IA.